Today we talked about "that scientist that digs up dinosaur bones." Most of the children already knew that this person is a paleontologist. (I actually think they are smarter than me.) I tried to bring up the fact that actually finding and digging up dinosaurs is not an easy job. I asked the children if they could think of anything that might make the job hard. I got: it's hard to find the bones, you have to be careful so you don't break the bones, it takes a long time to dig them out, digging in rock is hard--okay, now I've got nothin'. Yes, they hit all the points. My objective today was to give them a feel of how difficult it is to dig out a dinosaur and to let them use tools like paleontologists use. Of course, we didn't have realy paleontologists' tools, but we did use "tools." The children actually love this activity. If you get a chance you should try it at home. Each child gets a paper cup. Inside the cup I have frozen a small dinosaur figure. They must use the tools to get the dinosaur out of the ice. Their tool--a nancy bottle filled with water, and wooden picks. Some of the children have all the patience in the world and keep working and working. Others will finish off two of the bottles of water and say, "It's not working." We didn't do it for them though. Each child was able to dig their dinosaur from the "rock" and then take them home. They are all so proud and excited when they complete their task. Our craft was a dinosaur hat. I cut a shape out of paper, stapled it together, and let them decorate it. They didn't go home today as some were very "heavy" with glue. I also had dinosaur stamps and ink pads out on the table for the children to do some stamping. Some of them "really" enjoyed this activity. So much so that we were removing dinosaur stamps from faces. We read a pretty funny story today too. 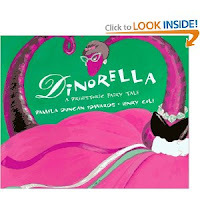 It was called "Dinorella," by Pamela Duncan Edwards . It is based on the story of Cinderella, but uses a dinosaur. Also, just about every other word starts with a "D." You really have to do some good tongue exercises before you read this book. It's funnny--at least the kids thought so. (I had to change one word as I'm sure it would have gotten qutie a reactioan. They use the work "dummy" for the bad guy so we just changed it up a bit." Tomorrow is the big day. We use our skills to go on a hunt outside for dinosaur bones and see what we can create.